We spent 6 days in Osaka with ten people. 5 adults and 5 kids all under 10 years old. It was such a fun experience! It wasn’t hard at all because Osaka is not as busy as Tokyo, so not that many people even in subways. The transport system is fairly easy to use (once you figure it out), and people are helpful – and try hard to answer you in English. We stayed at an AirBNB, and it was a huge place considering Japan. Two floors, 3 rooms, 3 toilets, one bath. And it was walking distance from the Daikokucho Station. Our AirBNB link. We took Cebu Pacific and arrived in the evening of Tuesday. I wanted to commute directly to the AirBNB, but was prevailed upon to use an airport taxi. Especially with 5 kids at 11pm traveling. I booked the taxi service via the Kansai Airport website. The driver spoke English, the van had wifi and it was a spacious van good for all of us. The drive was 45 minutes away from the airport, and it was well worth it. For our official Day 1, we started the day at 10am (had breakfast at home, got everyone ready – which was the start of the day for the whole week, except the last day). Our first stop was Osaka Castle with the cherry blossoms. For the train system, as a foreigner, get the KANSAI ONE PASS card. It is for all trains and other modes of transport. There are two subway lines using different cards, so the KANSAI ONE PASS gets to use all of it. You can get it at the airport, and recharge it anywhere. Also, the remaining balance can be reimbursed before you leave. Osaka Castle is a beautiful place, lots of history. I don’t really recommend going in the castle itself unless you are a lover of Japanese history. Or if you want to see a view of Osaka – though you can get that view in a lot of other places. We had lunch right outside the castle with ready to eat ramen. And then took a river cruise which allowed us to rest for a bit. From there we went to Umeda Sky Tower, and there is a wonderful view of the city. We got there at night, so it was even better. Had dinner at the tower basement – Okonomiya Kiji. Day 2 we spent the day at Universal Studios! They just opened the Harry Potter area, so it was more for us big kids than the little kids. Our third day, we went to the outskirts of Kansai – to Nara. Nara is known for the deer that freely roam around the area. You can feed them, and just enjoy the scenery. It was very chilly and windy when we got here, so it was even better! Escaping the heat of Manila. 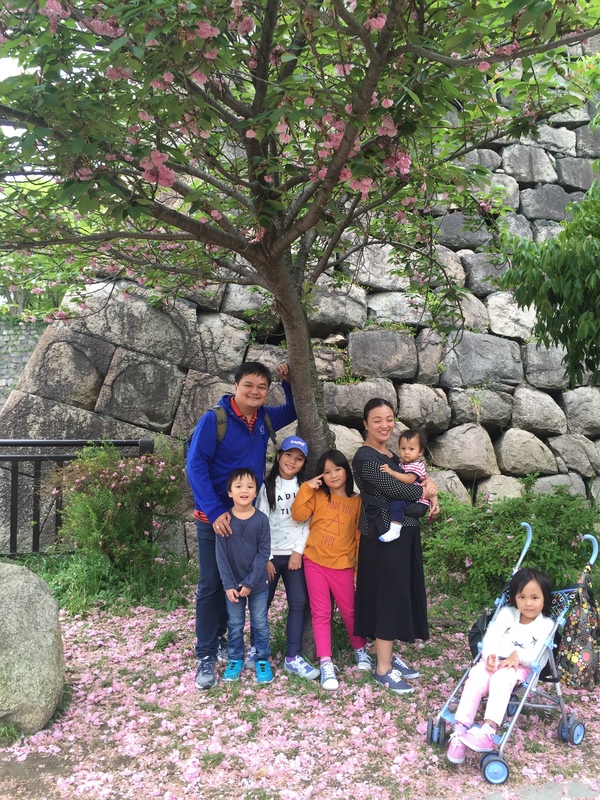 We spent one day each in Universal and Nara, and in the evening when we got back, the kids went home, while the moms went shopping. Day 4 we went to the Osaka Aquarium and the giant Ferris Wheel – they are right beside each other. The Aquarium was interesting because they had penguins, dolphins, etc. I just expected more though. The ferris wheel was another good view. And was so high! Hard to keep focused especially when you are at the top. We passed Kuromon Market on the way home to have fresh sushi! And walked through Namba. Our last day was a Sunday, so we researched where to go to Catholic Mass – 9am. It was mostly Filipino and we got to introduce ourselves to the congregation. We had to check out by 11, so we rushed back to the AirBNB. We hired the same airport taxi to pick us up, tour us a bit before dropping us off at the airport. We were able to go to Dotonburi and try their awesome ramen. There were so much people there! Nice set up too. You get a ramen stall and they just serve you without you even seeing them. And even a quick stop at Toys R Us and the Rinku Outlet shops near the airport. Thank you for the wonderful time, Japan! We love you!